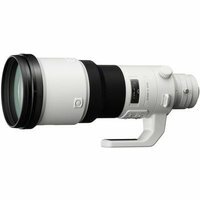 The Sony 500mm f4 G SSM Lens is a high-performance ultra-telephoto lens with a 500mm fixed focal length and is ideal for capturing sports, wildlife and other demanding imaging applications requiring a high level of magnification. The bright f4.0 aperture allows use of faster shutter speeds to broaden shooting opportunities and is great in low light. The G stands for Sony's Gold series of lenses and are Sony's top-shelf professional lenses offering excellent image and build quality. The Sony 500mm features an advanced optical design with 11 elements in 10 groups, including three ED (Extra-low Dispersion) glass elements and AR Nano Coating which cuts reflections for extremely low ghosting and flare. The new SSM (Super Sonic Wave Motor) drive circuit ensures high-speed autofocus  ideal for capturing fast-moving subjects.